his is to acknowledge all the greeting and well-wishes my wife and I have received on our journey to the Berlin marathon. I am slowly getting the marathon jitter in anticipation of Sunday’s event. Tomorrow, we leave for Berlin to start the festivities of marathon weekend. I am still overwhelm at the opportunity of running Berlin. With the relapse of my cancer, I had thought this would not be possible. I will soak in every moment when I stand on that starting line. I have won already by being there. All I have to do is enjoy the bliss of excruciating pain for six hours. Ha! I will see you at the finish line. ayo is a dead end. The solution I wanted to hear did not pan out. The doctors at Mayo told me that my only option is more chemo treatment. There’s more. They validated the only two remaining chemo drug options available to me: one I had an allergic reaction to and the other a new drug recently approved by the US Food and Drug Administration (FDA). Needless to say I was disappointed and at the same time relieved. The trip to Mayo clearly showed not only the road ahead is hard and challenging, but I am also headed in the right direction. I am getting the best care possible from my current doctors—world class care. 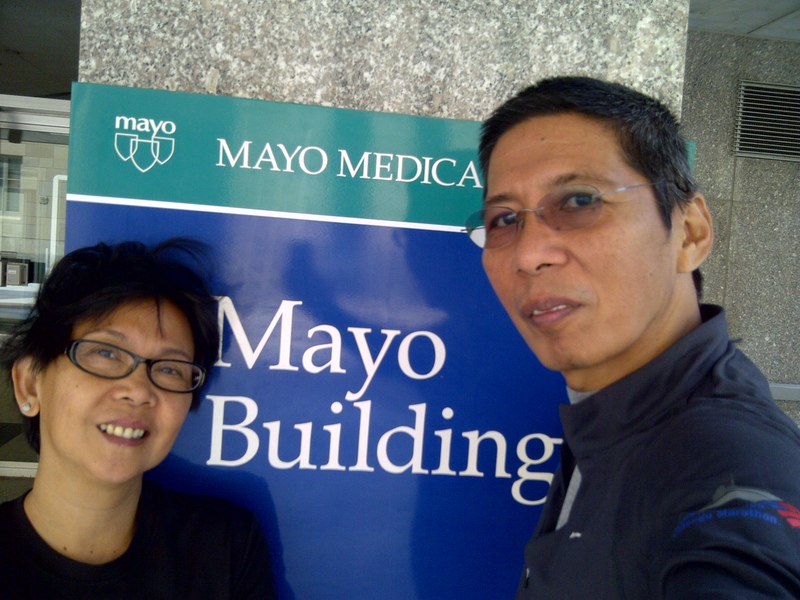 The Mayo world is amazing; you can see their singular focus on patient care. The technology and resources they harness for their patients are impressive. They make it easy for you by building a whole ecosystem around you. You check-in and you are provided with your scheduled appointments. If additional tests are needed, they handle it. They help you find the find the answer, thereby giving hope. Reluctantly, I found my answer: my options are limited. I need to trust the path in front of me and use hope as a guiding light. This journey is like walking through a labyrinth, wherein the only choice is the decision to enter and trust the path. I wish it was simple. I have anxieties. The anxieties I feel, at times, suffocates the trust that needs to shine through for me to finish. I am glad you are there. I will get to the end of this path, just be there. Tomorrow, I leave for Basel, Switzerland for a month on business. From there it will be a short hop to Berlin, where my wife and I will run the marathon on September 30. I have many people to be thankful for this opportunity and I know you will be cheering for me. The Berlin marathon is a new ‘labyrinth’ for me and it is the fastest course in the world. I will be lost among the over 40,000 runners. I will be a runner not a cancer survivor. It will be blissfully painful. Besides, I got to give those Kenyans a run for their money. U-S-A! U-S-A! P.S. My oncologist gave me his consent to be gone for a month on a condition I take an oral chemo treatment (in pill form) after the marathon. Whoever invented this oral chemo should be shot! But I love my oncologist. No worries. I have my personal nurse, wife, training partner traveling with me so, I am good to go. have traveled to Rochester, MN many times for business. The first thing you would notice at the boarding gate are the number of people on wheel chairs or those needing assistance. Today, I have a different perspective of them. I am one of them. I don’t need a wheel chair or need assistance, but like them I am going to Mayo Clinic. My wife and I decide to get a second opinion to find a cure for my metastatic lung cancer. This was what was agreed upon with my oncologist, after discussing all my options. My oncologist prescribed more chemo using a different set of drugs but before I submit myself to another hardship treatment, I want to find out other options e.g. surgery or radiation or whatever. I just want to be cured or be given a break. “The Mayo Clinic is the largest employer in Rochester, MN: over 40,000 employees. It use to be IBM but Mayo has surpassed them all.” The shuttle bus driver interrupted my thoughts. Except one, all the passengers were Mayo-bound. I use to arrive here confident in my stride, heading straight to Hertz, where they have my car rental ready. With my bags in tow, I head straight to work. For this trip, I could get a car but this is not work; this is personal. As the bus driver continued his entertaining stories, I am starting to see this city differently. I have seen the cluster of Mayo buildings many times, while driving from the hotel to work, but I have never entered it before. Tomorrow, I will enter it as a patient. I have front-row seat to one of the best hospitals, if not the best, in the world for patient care. (At the airport they even have Arabic-translated brochures of Mayo; a favorite in the Arab countries). Needless to say I am anxious. I have gathered all my medical records, scan images, surgical report, biopsy slides, etc., and put them in a binder. I made my own summary of my medical history, which brought back memories of my journey. My cancer journey started in Rio de Janeiro, Brazil (March 2008) and I hope it ends here in Rochester, MN. That’s four years of numerous chemo cycles, two surgeries: colon and liver, and long days and nights of dehydrating chemo side-effects. Some of you were there to witnesses to my hardship. Of course, I could not help look at those episodes of grief and pain with as sense of accomplishment and blessing as well. In reading about Mayo, I was struck by their mission statement that begins: “To inspire hope…” There it is no need to read any further. I get it. Let this journey end here. Suddenly, Rochester is beginning to look different to me. P.S. Some factoid: Mayo is a not-for-profit organization that channels all their resources to patient care and research. With that in mind, I will run for Mayo Clinic at the Berlin marathon this September 30.